I am very excited to share this book as my first ever book club pick! You are in for a thrilling ride as you dive into Ms. Heiter’s world of FBI criminal profilers and serial killers. If you haven’t purchased the book yet, I have the Amazon link below. Check back throughout the month for an interview with Ms. Heiter and also the star of Hunted, Evelyn Baine. While I hope to encourage discussion about the book, please wait until the end of the month to post comments that include spoilers. We wouldn’t want to give away the ‘who done it’ for other readers. I have two giveaways for the month of March. Anyone who leaves a comment in any of the book club post during the month is eligible. First is an autographed copy of Vanished, the exciting sequel to Hunted. I also will be giving away a $10 Amazon gift card. If you don’t follow the blog, please leave your e-mail address with at least one of your comments so I know how to contact you if you win. To enter, all you have to do is leave a comment in any March book club post! I hope that you enjoy Hunted and let’s have some great book club discussions throughout the month. So my first question to start things off is…How do you think you’d do as a criminal profiler? Would you be able to work a violent crime or would witnessing a brutal scene, like the Bakersville Burier, leave you up at night? This entry was posted in Book Club and tagged book club, book talk, hunted, reading by Laurie Winter. Bookmark the permalink. I read and enjoyed this book. Can’t wait to read the next in the series! Thanks so much, Cheryl! I’m looking forward to diving into your latest!! I’m glad to hear you liked it Cheryl! As to the question of how I’d fare as a criminal profiler – I would like the problem solving aspect of the job, trying to figure out who committed the crime and why. I don’t know how I would handle seeing the crime scenes. I picture the Bakersville Burier, with the half buried bodies, and wonder if I’d get sick witnessing that brutality. Not only are you seeing it, the smell must be awful! I’m the same way, Laurie! I think I’d be good at the puzzle, but seeing all those crime scenes? Regardless of whether it was in person or through photos, that would have to leave behind some trauma! I love to solve puzzles and try to figure out who did when I read. To do it in real life, I am with LaurieMichele, would like the trying to figure it out, but don’t know about the crime scenes and pictures. Will definitely get it and read. I loved the book!! I wanted to be in the FBI and I actually interviewed when I was 23 for surveillance. I didn’t get hired though. I would be a terrible profiler.I loved reading Hunted and I already read Vanished too. They were great reads. I can’t wait for the next in the series. That’s pretty cool that you interviewed with the FBI. If I can ask, what kind of degree(s) does the FBI require for surveillance? That is pretty cool. I know someone who started in surveillance and then moved to a Special Agent position. Thanks so much – I’m so happy you’re enjoying the series!! Great read coming from someone who rarely picks up a book! Thank you for next-to-no gore. I was concerned at first that reading the book would prompt nightmares, but it didn’t. I only seem to know how to read a book all in one or two sittings, so while you kept me completely engrossed, you also provided natural pauses/places where I felt satisfied for Evelyn. I wonder if researching your characters imprints on you as I’ve heard it does for actors. Does it alter your own personality much by becoming their voice? As for the question of what part of profiling I would be intrigued by, I say the behavioral side and psychology of the killer. As absolutely horrible as the crimes are, there’s always a story of how that person got to be what they were. Discovering and understanding that puzzle would be important to me to help prevent others from getting to that point. Hi Rosalie! Thank you so much – I’m thrilled to hear that you enjoyed HUNTED, especially as an infrequent reader! To your question about the research imprinting on me, yes and no. I don’t ever feel like it alters my personality, but I will say that some of the research took me to some deeply disturbing information (the kinds of details I needed to know to be accurate in writing a profile, but don’t include in great depth in the story because I don’t want to turn readers off!). There were points during the research process that I needed to take a break. I’m intrigued by the very same thing in profiling! 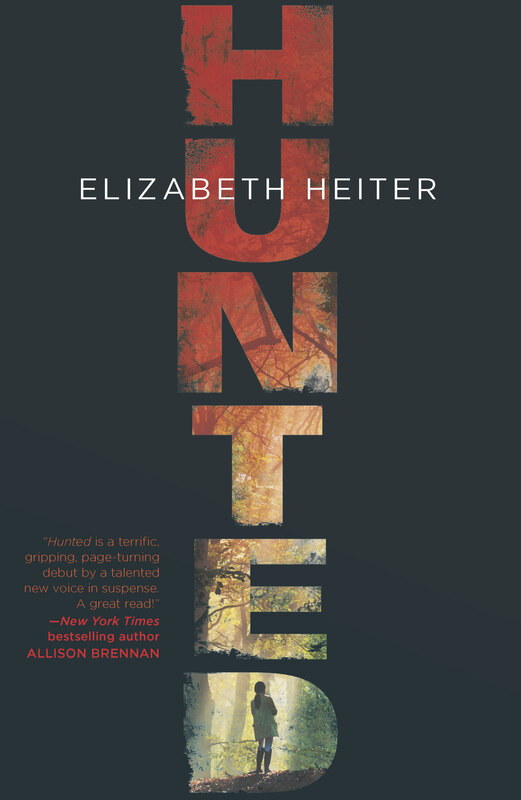 Part of what interested me in writing Hunted was contrasting Evelyn (who also started off in an abusive home but went into law enforcement) with the Bakersville Burier, and why two people who had some similar early experiences chose such different paths in life. Thanks so much for stopping by, and for your insightful comments! It’s great chatting with you! !